I have a lot of great plans for this coming year. A few projects to share, some photowalk adventures to be had and a whole lot of crafting! Over the weekend I have been blog surfing, crafting, hanging out with friends, and unfortunately getting sick. So I shall make this post quick and hopefully get some rest. There are so many great blogs out there, that I feel almost overwhelmed and sheepish to create my own. I’m still finding my voice and hopefully I can narrow a bit of what I would like to share. Thus far it seems I like to dable in just about everything crafty. Either way here are some pictures of my first craft session of the new year. I am in love with the golden, curry yellow right now, paired with a creamy white and kraft paper brown or a light earthy grey. These are simple to make and rather inexpensive, the time consuming element are the embellishments. 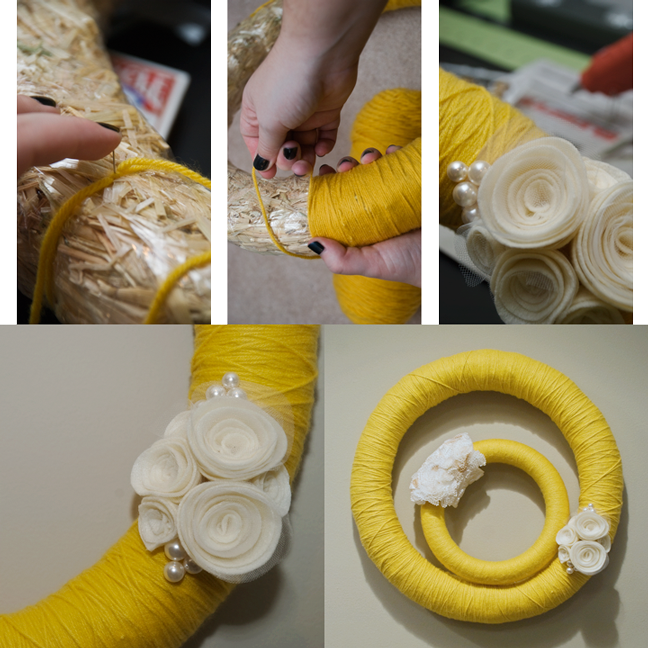 The larger wreath has six felt roses and few with tulle for an extra softness. For the smaller wreath I used mini cup cake liners. These two wreaths will be going in our bedroom as I redecorate and get things organized. I have made four of these wreaths and am addicted, so I’m sure you will see more! This year, my husband and I have decided it is the year of us. We have dealt with some major upsets this past year, and would really like to focus on us, to find our voice, our style and who we want to be as grown ups away from our parents.This will be a challenge is listening to our inner voices and compromise with each other. We are excited to go on more mini vacations and explore our surround area. We have created a list of places to visit, local and out of state. Some of these adventures will be open to photowalks, so stay tuned. I hope to have a list of dates and locations soon. I’m still working on pictures, I did not realize how backed up I had gotten. I’m making progress though, which is very exciting. I love sharing my vision with other people! Website is coded to my liking skill level , however I’m indecisive about colors and branding so this may be changing. I just think the black is a little to dark for my personality. How was your new years? Any resolutions you would like to share?